Right away on my first day in Kerala I liked these “Ordinary” buses. KSRTC purchases 16-ton GVW truck chassis from either of two manufacturers, and then contracts the body construction to a few different coach builders. 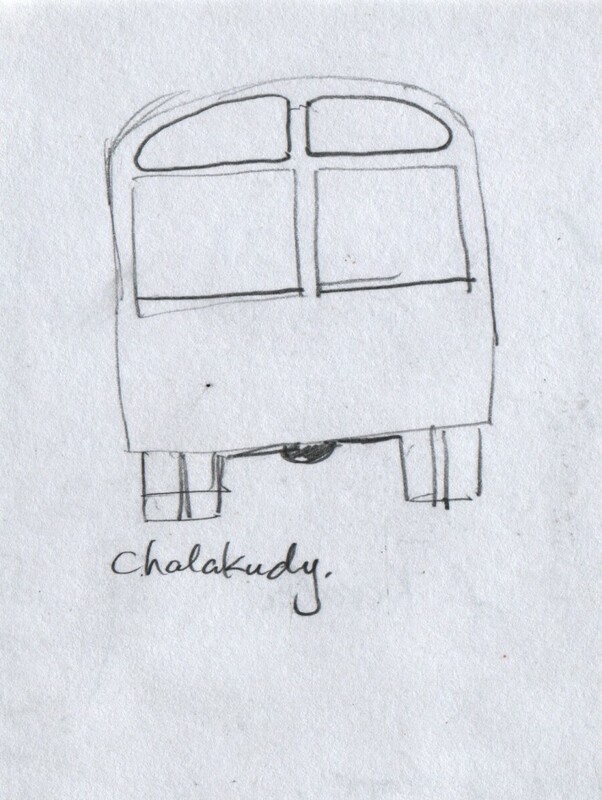 One person told me that a local nickname for the Ordinary bus is “Elephant”. I found these buses wonderful to ride in, and I preferred them to the glassed-in coaches and air-conditioned buses that were also available. These buses are made mostly of metal, with some upholstery on the seats. The only glass is in the windshield and rear window, and a small corner light near the A-pillar. The basic design uses a flat, divided windshield and the identical shape as the rear window. This makes for more economical repairs, I would think, with the half-pane of glass being easier to transport and serving four locations on the bus. The side windows have curtains, folded accordion-style, held within the upper window-frame. In my time there, the curtains held off the rain just fine during a cyclone rainstorm. The high ground clearance permits the buses to operate in areas with bumpy roads. These buses appeared to be extraordinarily durable. I saw an apparently open-ended variety in construction details, perhaps due to different generations of models, different constructors, and repairs by regional repair depots. I like the KSRTC Ordinary buses. I liked seeing the variety of window patterns, and recorded the variants that I saw. More KSRTC bus rear windows. 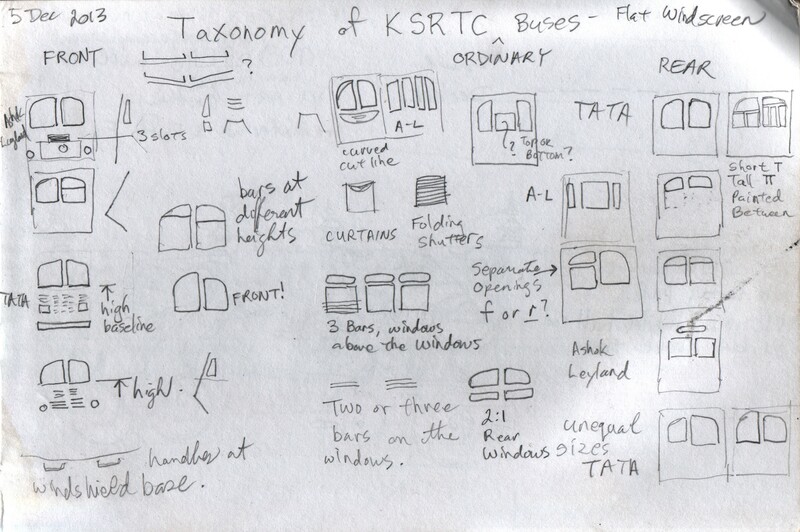 More details for KSRTC bus taxonomy. Another study of a KSRTC ordinary bus rear window. 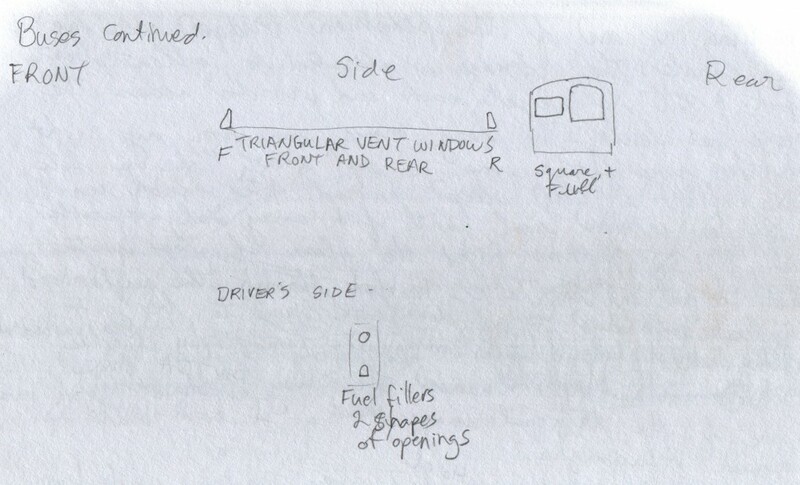 I enjoyed seeing the variety of window shapes on the buses. 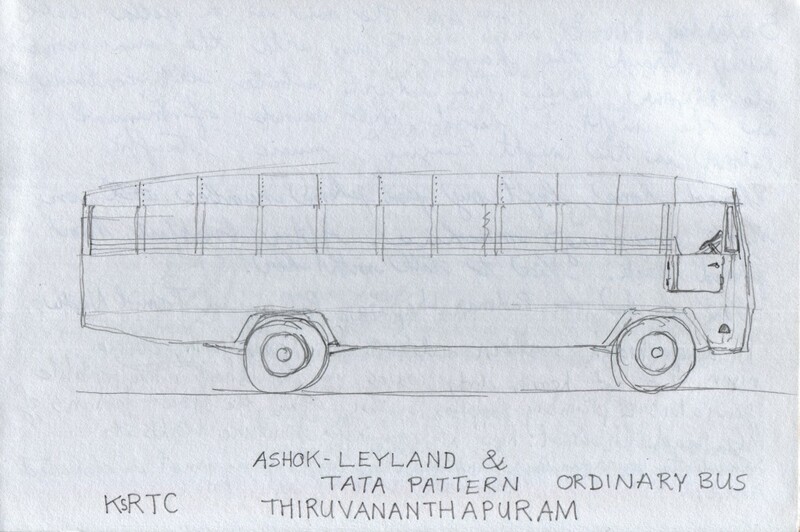 Thank you for your interest in these pages about the KSRTC buses. I will reply as you requested.